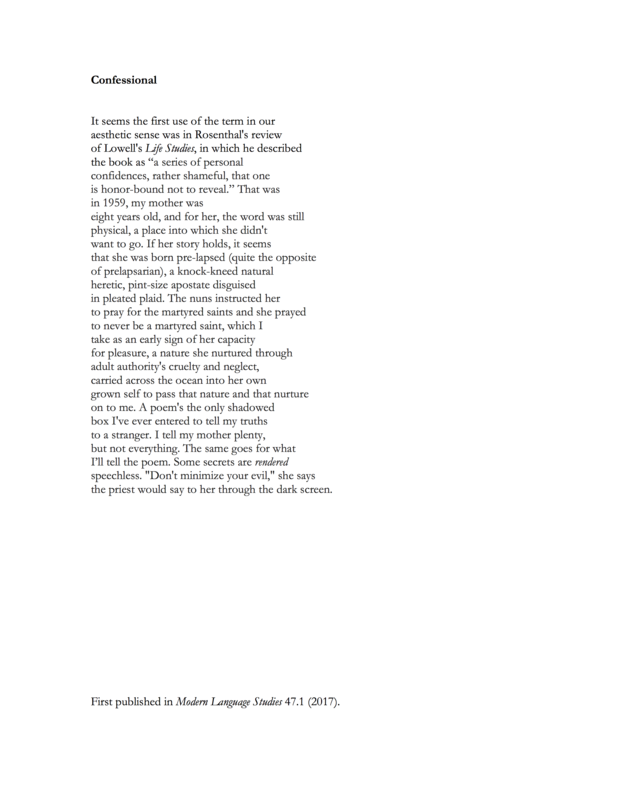 The links in this document correspond to the poem excerpts featured as work samples here. The first link also features an audio version of "I Now Pronounce You." Scroll down through the Projects section of this portfolio for a more in-depth sense of my body of work. Flourish is my fourth book of poetry, forthcoming from Carnegie Mellon University Press in 2020. 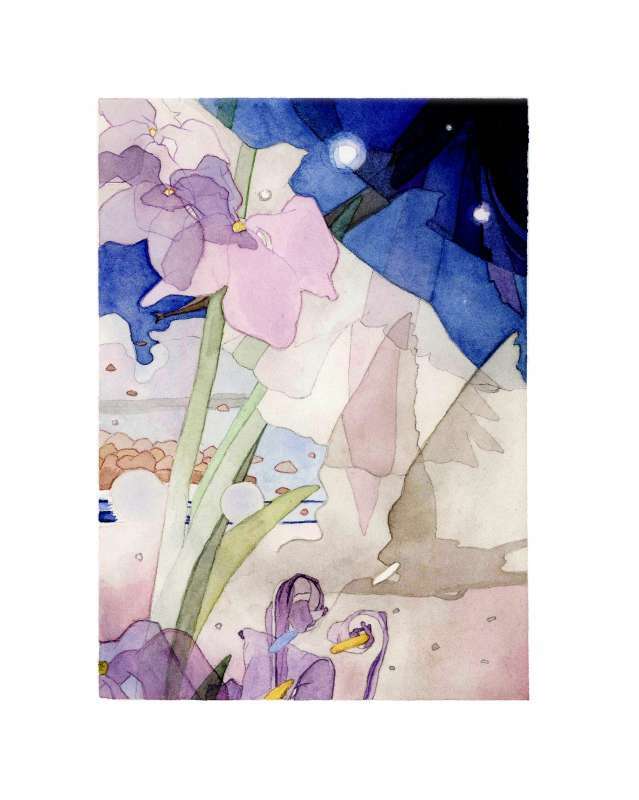 In Flourish, multiple meanings catch light—as the leaves of growing things might, or the facets of cut gemstones, or a signal mirror flashing in distress. These poems explore themes of thriving, growth, innovation, and survival, while immersing the reader in the pleasures of language itself—the “flourish” of linguistic gesture, play, form, turn, and adornment. Here, the lens zooms in and out to micro and macro levels, asking us to see the familiar with new eyes. The collection engages with the materials of the worlds we inhabit—natural worlds and those of our own making—and a full spectrum of poetry’s own materials, building worlds of words and illuminating the shadowed terrain of our interior landscapes as well. Poems from Flourish are featured on the Academy of American Poets website and have been anthologized in The Best American Poetry 2015 (Scribner, 2015), Poem-a-Day: 365 Poems for Every Occasion (ABRAMS, 2015), The New Census: An Anthology of Contemporary American Poetry (Rescue Press, 2013), and Still Life with Poem: 100 Natures Mortes in Verse (Literary House Press, 2016). Poems from Flourish have also appeared or are forthcoming in publications that include: Birmingham Poetry Review, Crazyhorse, Diode, The Hopkins Review, The Iowa Review, Lana Turner, Memorious, The Morning News, New England Review, The New Yorker, OmniVerse, Pinwheel, The Rumpus, Thermos, Versal, and Whiskey Island. The editors of numerous anthologies, magazines, and journals have selected poems from Flourish for publication, including Sherman Alexie (The Best American Poetry 2015), Paul Muldoon (The New Yorker), Kevin A. González and Lauren Shapiro (The New Census: An Anthology of Contemporary American Poetry), and Rebecca Morgan Frank (Memorious). Numerous poems from Flourish are available to read online by following the links provided here. "Working Order" is a short film adapted from my poem of the same name. A Vimeo Staff Pick, it was commissioned by Motionpoems and created by Gentleman Scholar in 2014. 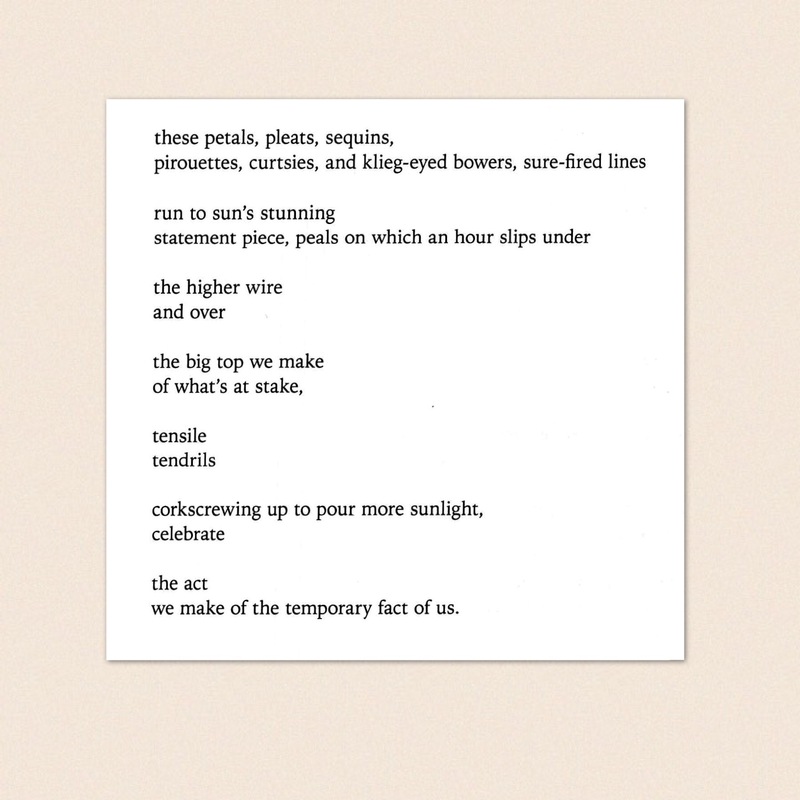 First published in The Iowa Review and forthcoming in Flourish, you can read the full text of "Working Order" by following the link in the "Flourish: Poems to Read Online" document. "Progress" is a short film adapted from my poem of the same name. It was commissioned by Motionpoems and created by Morgan's Brother in 2014. First published in Thermos as part of a feature on contributors to The New Census: An Anthology of Contemporary Poetry and forthcoming in Flourish, you can read the full text of "Progress" by following the link in the "Flourish: Poems to Read Online" document. 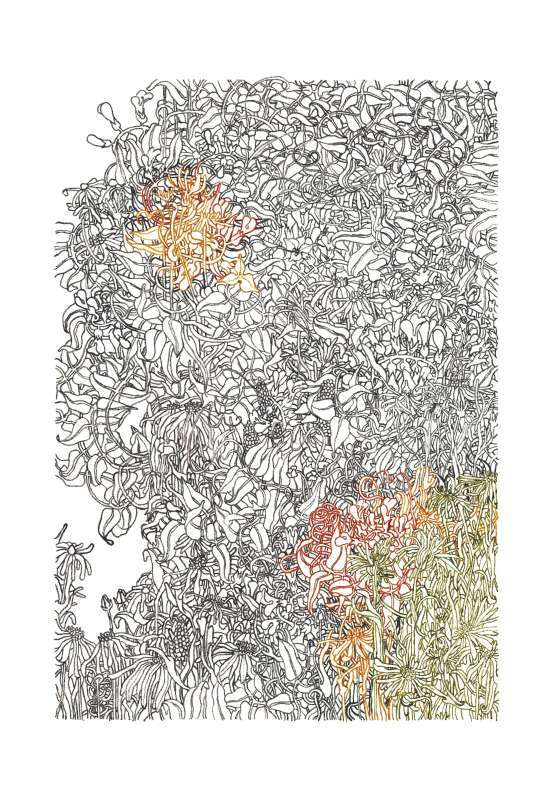 "Catoctin Mountain Park," included in Flourish, was commissioned as part of the Imagine Our Parks With Poems project. In celebration of the National Park Service Centennial, the Academy of American Poets commissioned fifty poets to write poems about a park in each of the fifty states. I was asked to represent the state of Maryland. This project is part of Imagine Your Parks, a grant initiative from the National Endowment for the Arts created in partnership with the National Park Service to support projects that use the arts to engage people with the memorable places and landscapes of the National Park System. The poem itself is followed by my commentary on my process in writing the poem. You can read both poem and commentary here, or follow the link in the "Flourish: Poems to Read Online" document. I'm honored that the esteemed poets Terrance Hayes, Ilya Kaminsky, Rick Barot, and Erika Meitner wrote advance endorsements of Flourish. Stet is my third book of poetry, forthcoming from Princeton University Press in 2018. Stet takes constraint as catalyst and subject, exploring what it means to make (or break) a vow, to create art out of a life in flux, to reckon with the body’s own bounds, and to arrive at a place where one might bear and care for another life. 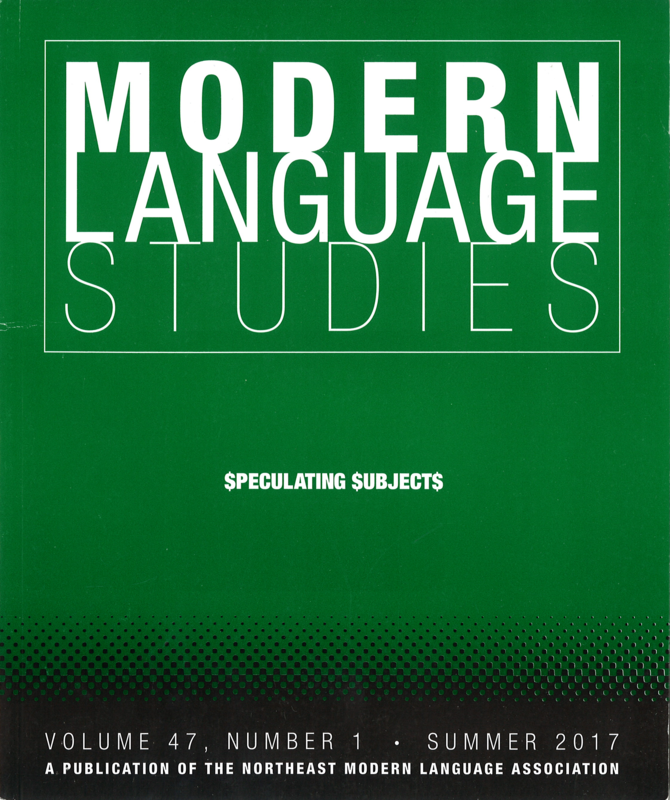 Through the processes of constrained forms, particularly the revealing limitations of the anagram’s dismantling and binding, Stet’s procedural methods and serious play insist upon the intimacies and connections to be found within the multivalent materials of language written and language sounded. Stet translates roughly as “let it stand,” a proofreading annotation used to retain or return. 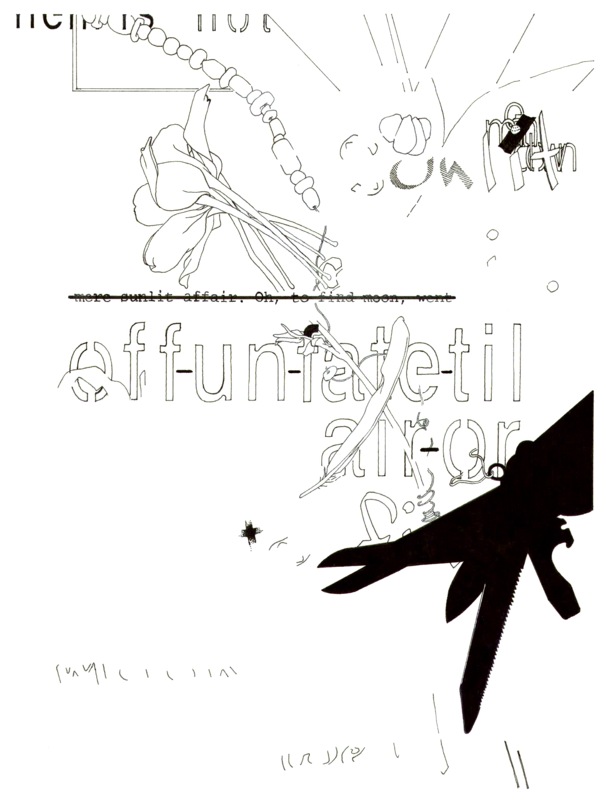 This sense of uncertainty (changes made and then reconsidered), haunts the collection as its poems explore what is left unsaid through erasures, redaction, and orthographic limitation. How does one “go back on one’s word” or “stand by” one’s decisions? Can a life ever actually be “remade” or “revised,” or are past elements ever-present as palimpsest? The uncertainty of both actions and representations of those actions is the truth of the matter. Embodying the physicality and potential for “re-production” inherent in the collection’s forms and figures, the collection ends figuratively and literally expectant, not searching for closure, but awaiting the messy, living possibilities of what-comes-next. The book as a whole attempts to both trouble and console a reader who, like the speaker-author, longs for a fresh start and new language and must “make do” with building a life out of the materials (linguistic and autobiographical) at hand. This clip of the "making of" the short poem "[ ]or[ ]ask[ ]" is a reflection of the recombinant anagrammatic process behind many of the poems in Stet, forthcoming from Princeton University Press in 2018. This poem was first published in Bennington Review in 2016. Poems from Stet have appeared in numerous publications, some of which have made content available online. This document contains links to those poems, along with an endorsement of my work by National Book Award finalist Shane McCrae. 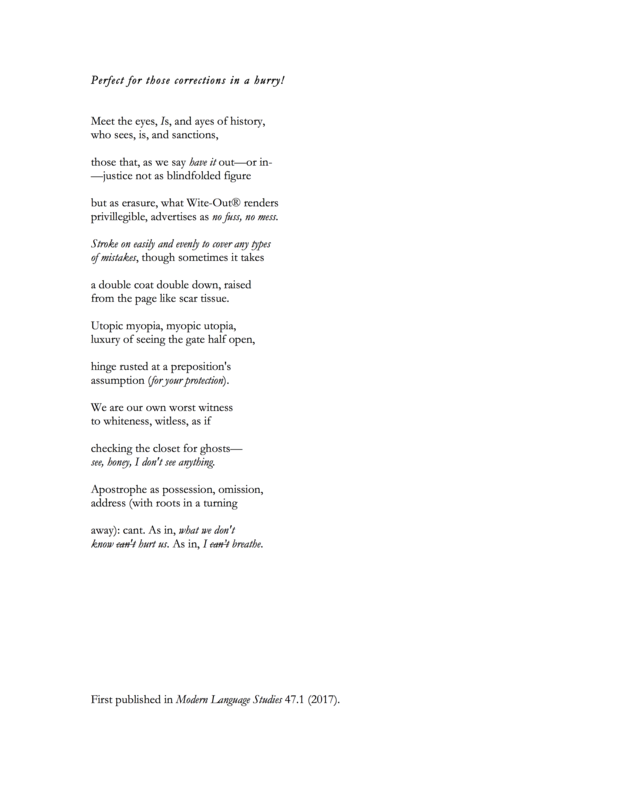 "Are not no tear," forthcoming in Stet (Princeton University Press, 2018), first appeared in Tin House. 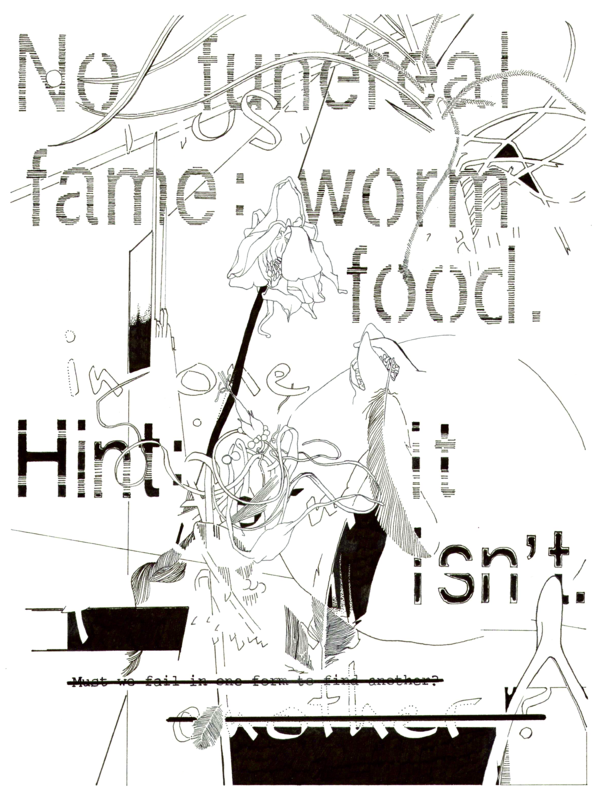 "[Cos(ign]eous)," forthcoming in Stet (Princeton University Press, 2018), first appeared in Hidden City Quarterly. 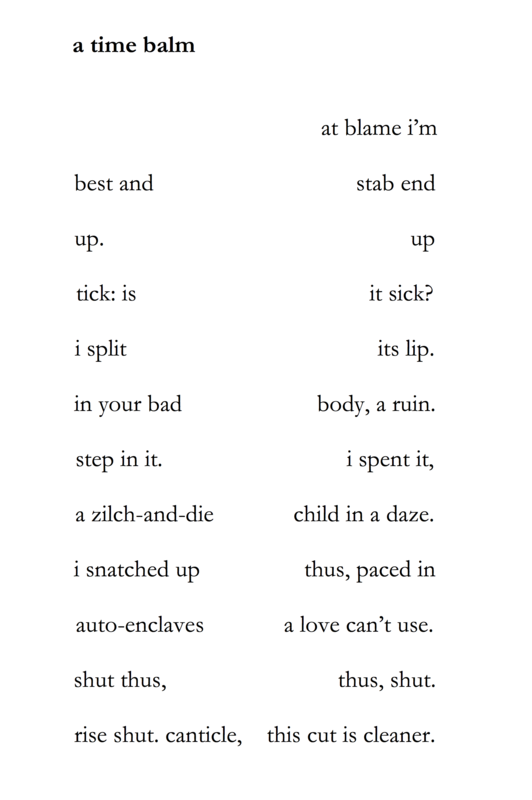 "A time balm," forthcoming in Stet (Princeton University Press, 2018), first appeared in Hidden City Quarterly. 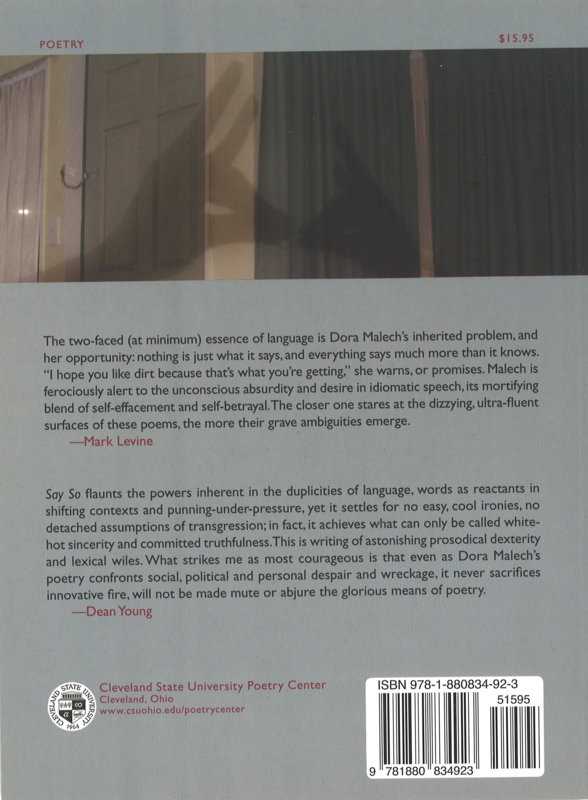 Say So is my second book of poetry, published by the Cleveland State University Poetry Center in 2011. 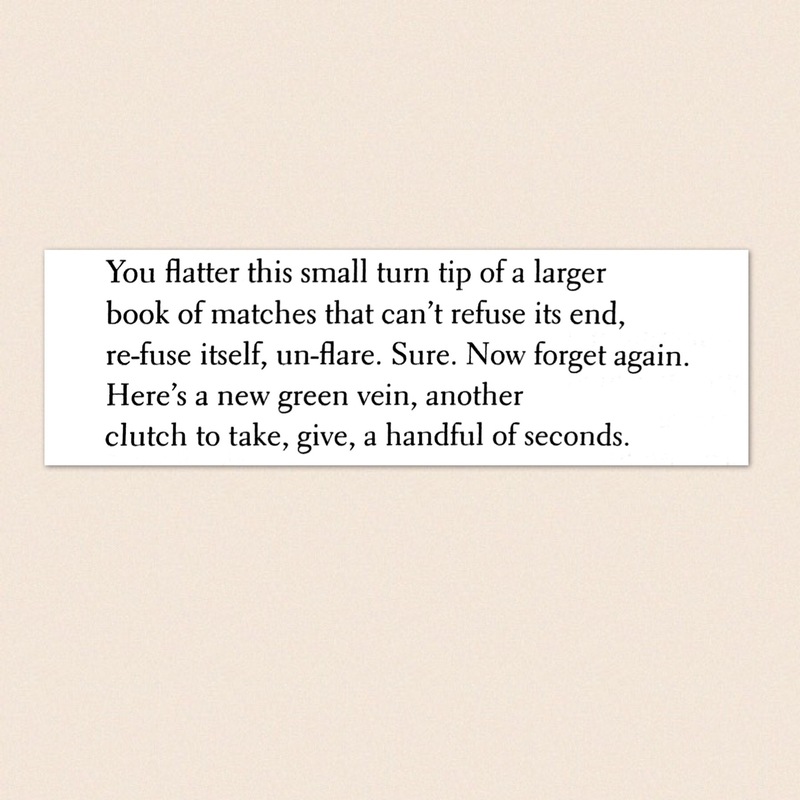 The poems in Say So are at once formal and experimental. Human utterance—be it prayer or plea or pun or turn of phrase or epithet—is one of Say So's primary pistons; poetic tradition—rhyme, meter, form, rhetoric—is another; the beauty and betrayals of the body, or bodies—echoed in the beauty and betrayal of language itself—is a third. Together, these forces provide the pressure that makes Say So move and brings these poems to life. 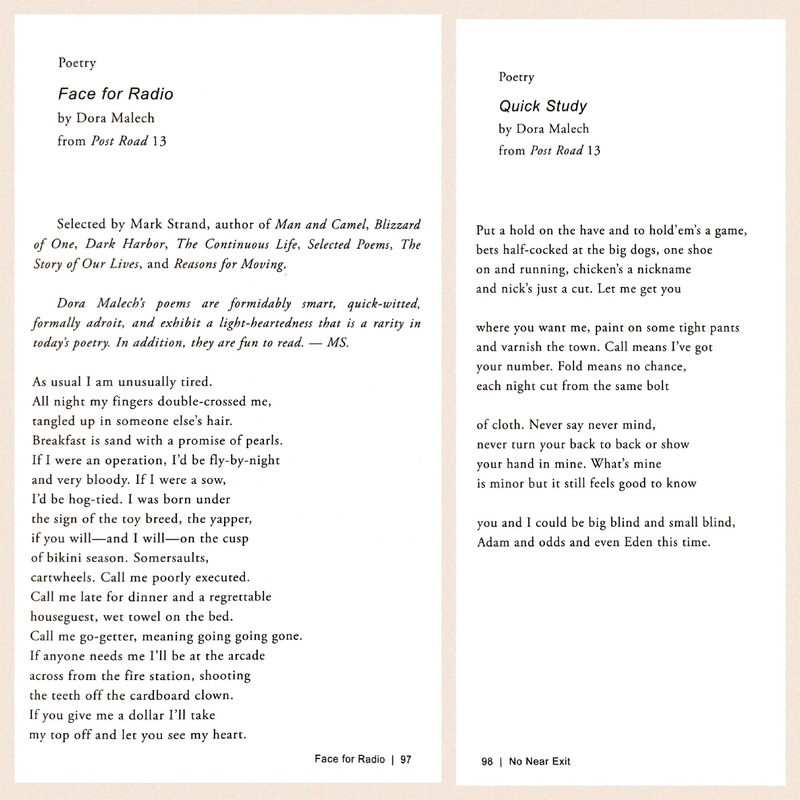 Poems from Say So are featured on the Academy of American Poets website and have been anthologized in The New Census: An Anthology of Contemporary American Poetry (Rescue Press, 2013), and No Near Exit: Writers Select Their Favorite Work from Post Road Magazine (Dzanc Books, 2011). Poems from Say So were published in numerous publications, including: American Letters & Commentary, Anti-, Barn Owl Review, Barrow Street, The Canary, Chelsea, Columbia Poetry Review, Denver Quarterly, Forklift Ohio, Gargoyle, Indiana Review, La Petite Zine, LIT, New Orleans Review, No Tell Motel, Painted Bride Quarterly, Post Road, Redivider, Sonora Review, Sport, Thermos, Tight, and Yale Review. Reviews of Say So appeared in publications that include The Rumpus, r.kv.r.y, New Welsh Review, On the Seawall, and The Berkshire Eagle. Here, I read my poem "The Station" from Say So at the ZYZZYVA + The Squaw Valley Community of Writers Bay Area Benefit to subsidize Dean Young's heart transplant. The readers were David Breskin, W.S. Di Piero, Joseph Di Prisco, Robert Hass, Brenda Hillman, Troy Jollimore, D.A. Powell, Octavio Solis, Michael Wiegers, and myself. Each poet read one of Dean Young's poems and one of their own. This reading took place in 2011. A number of poems from Say So are available to read online by following the links provided here. 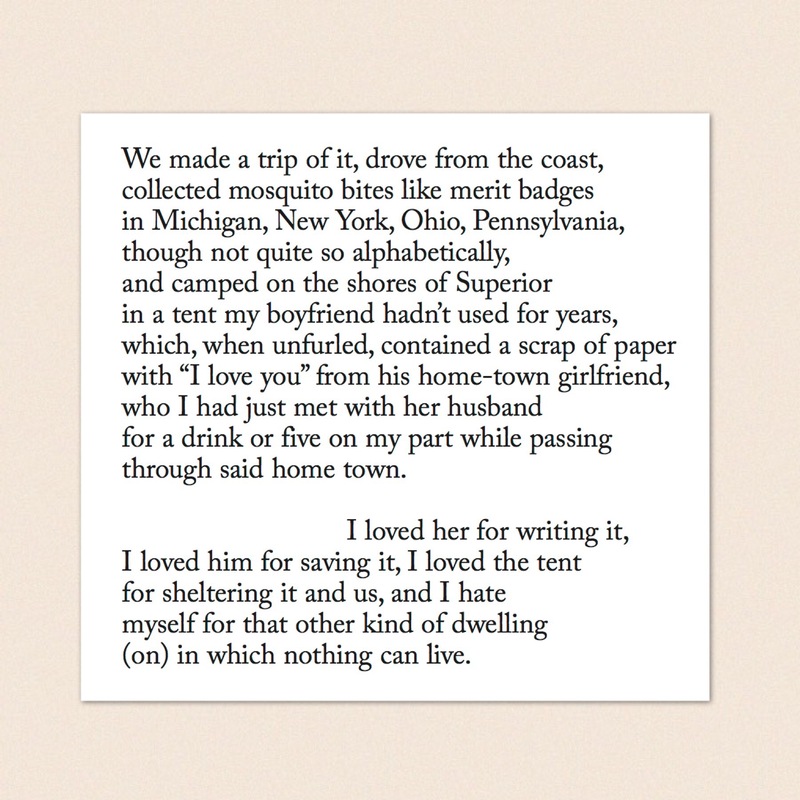 First published in Painted Bride Quarterly, "Love Poem" from Say So was also included in the November 2010 issue of Poetry Magazine as part of its Ruth Lilly Fellows portfolio. 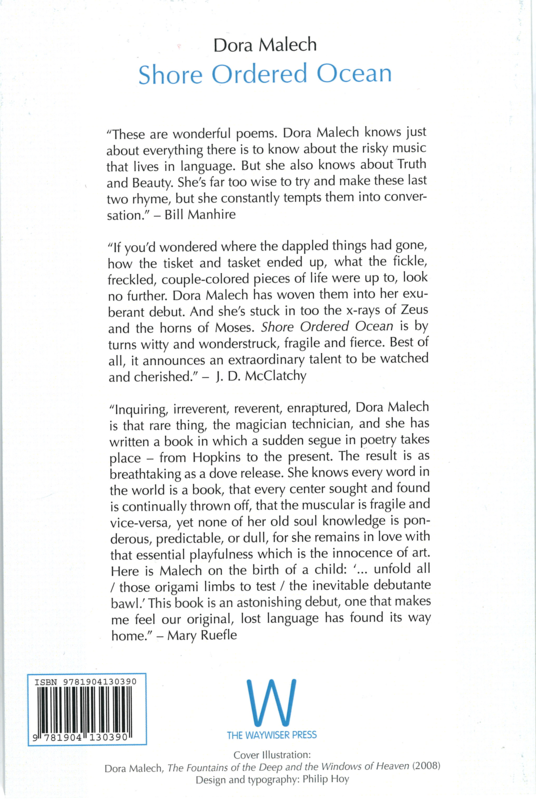 Poet Laureate Mark Strand selected the two poems from Say So above for the anthology No Near Exit: Writers Select Their Favorite Work from Post Road Magazine (Dzanc Books, 2011). 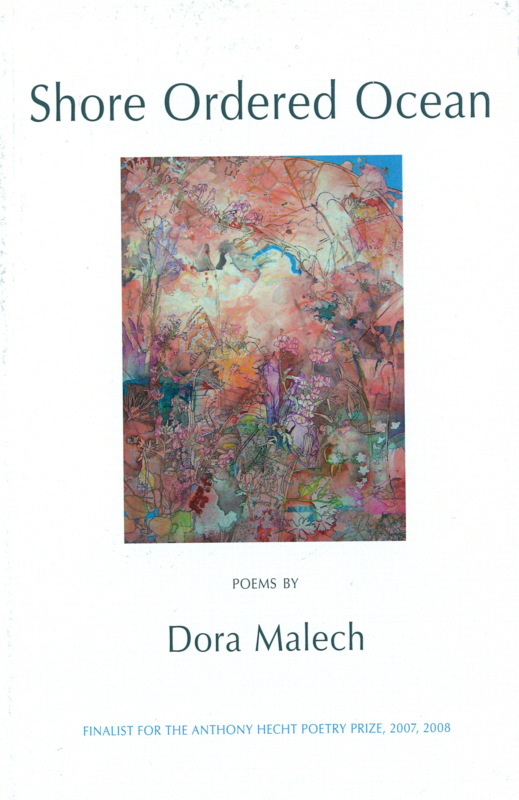 He wrote, "Dora Malech's poems are formidably smart, quick-witted, formally adroit, and exhibit a light-heartedness that is a rarity in today's poetry. In addition, they are fun to read." 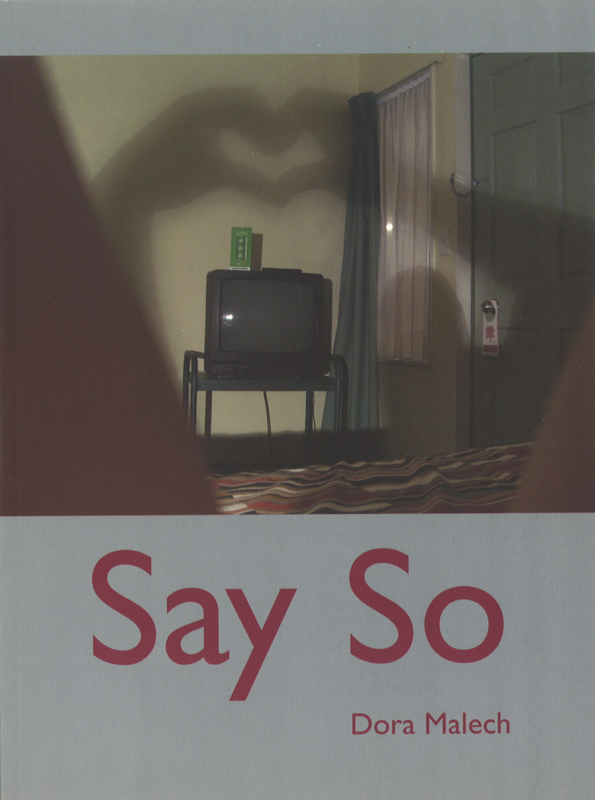 The cover of Say So features photography by artist Laurel Nakadate, with whom I have collaborated in the past. Poets Mark Levine and Dean Young wrote endorsements of this collection. Young writes that "it achieves . . . white-hot sincerity and committed truthfulness [in] writing of astonishing prosodical dexterity and lexical wiles." Shore Ordered Ocean is my first book of poetry, published by The Waywiser Press in 2009. By turns playful and serious, the poems in Shore Ordered Ocean, revel in the inherent tensions and pleasures of sense, sound and syntax, reveal the resonance in the offhand utterance, seek the unexpected in aphorism and cliché, and tap into the paradoxical freedom of formality. The collection explores place, politics, the body, love, art, and more. It is bound together by an urgent, physical relationship with language itself. Shore Ordered Ocean was longlisted for the International Dylan Thomas Prize. Poems from Shore Ordered Ocean are featured on the Academy of American Poets website and have been anthologized in Best New Poets 2007 (selected by Poet Laureate Natasha Trethewey), The Best of Poetry London, and The Hecht Prize Anthology. Poems from Shore Ordered Ocean were published in numerous publications, including: Gulf Coast, LIT, The New Yorker, Poetry, Poetry London, Poet Lore, and The Sonora Review. The poem "Dreaming in New Zealand" was included in Best New Zealand Poems 2007 and Big Weather: Poems of Wellington. Reviews of Shore Ordered Ocean appeared in publications that include Tarpaulin Sky, CutBank, MAKE Literary Magazine, and Poetry London. Here, I read my poem "Delivery Rhyme" from Shore Ordered Ocean at The Writer's Center in Bethesda, Maryland in 2010. "Delivery Rhyme" is dedicated to my niece; it was written in celebration of her birth. You can read the full text of the poem in the next document. 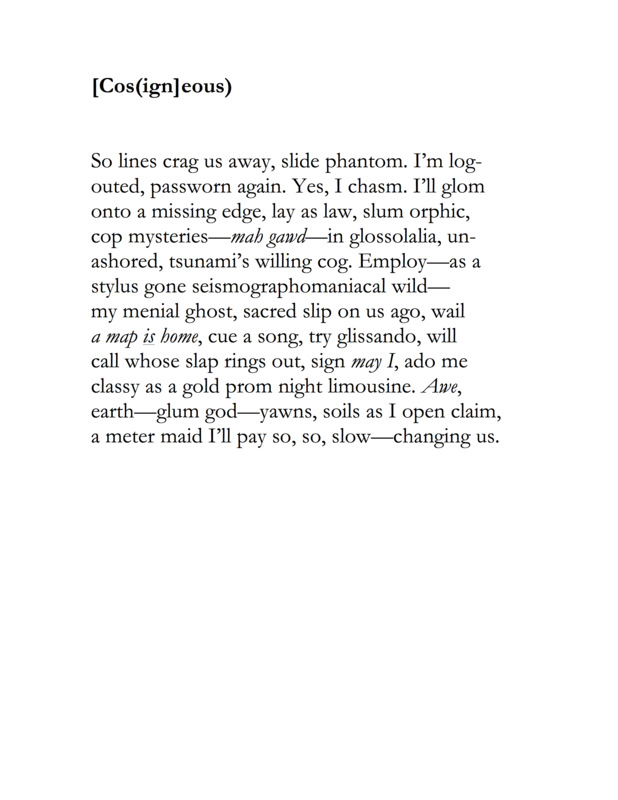 My poem "Delivery Rhyme" from Shore Ordered Ocean was first published in the November 2010 issue of Poetry Magazine as part of its Ruth Lilly Fellows portfolio. 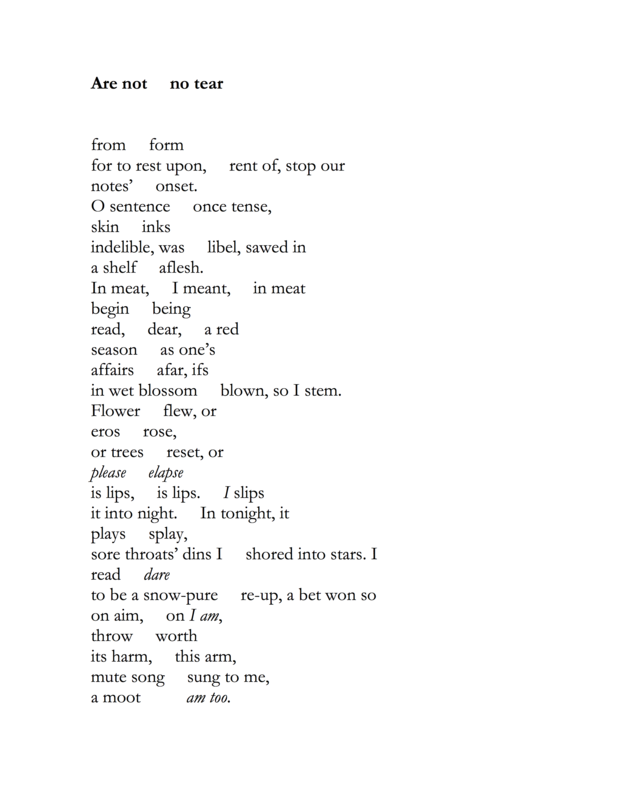 My poem "Makeup" from Shore Ordered Ocean was first published in the May 2007 issue of Poetry Magazine. The Academy of American Poets features my poem "Aleph, Bet" from Shore Ordered Ocean on its site. The Academy of American Poets features my poem "Breaking News" from Shore Ordered Ocean on its site. The cover of Shore Ordered Ocean features of painting of mine that shares a title with one of the collection's poems: "The Fountains of the Deep and the Windows of Heaven." The poets Bill Manhire, J. D. McClatchy, and Mary Ruefle wrote endorsements of this collection. Ruefle writes, "This book is an astonishing debut, one that makes me feel our original, lost language has found its way home." A number of poems from Shore Ordered Ocean are available to read online by following the links provided here. Commissioned by composer Jacob Cooper, the lyrics of "Unspun" were written in reaction to a haiku by Matsuo Bashō: “How delicately / The silver threads of rain / Sew sky to the earth.” "Unspun" is the penultimate and longest track on Silver Threads, Cooper's major label debut released by Nonesuch Records in 2014, a six-song cycle sung by soprano Mellissa Hughes. I am currently working with Cooper again on a libretto-in-progress called Threnos​, in collaboration with artistic director Karmina Šilec. Here is a live performance of "Unspun" as part of the Silver Threads song cycle for soprano and electronics, featuring soprano Mellissa Hughes. The performance was part of Q2 Music's Best of 2014: New Music event hosted by Meet the Composer's Nadia Sirota at The Greene Space in New York City on December 2, 2014. Here is the text of the song "Unspun," commissioned by composer Jacob Cooper as part of his Silver Threads song cycle. Q2 included Silver Threads in its praise for 2014's "riveting, jaw-droppingly gorgeous new recordings." Composer Christopher Perrone, Rome Prize winner and Pulitzer Prize finalist, featured "Unspun" as a 2016 Song of the Day at the New York Festival of Song blog, writing that "the text itself is beautiful." 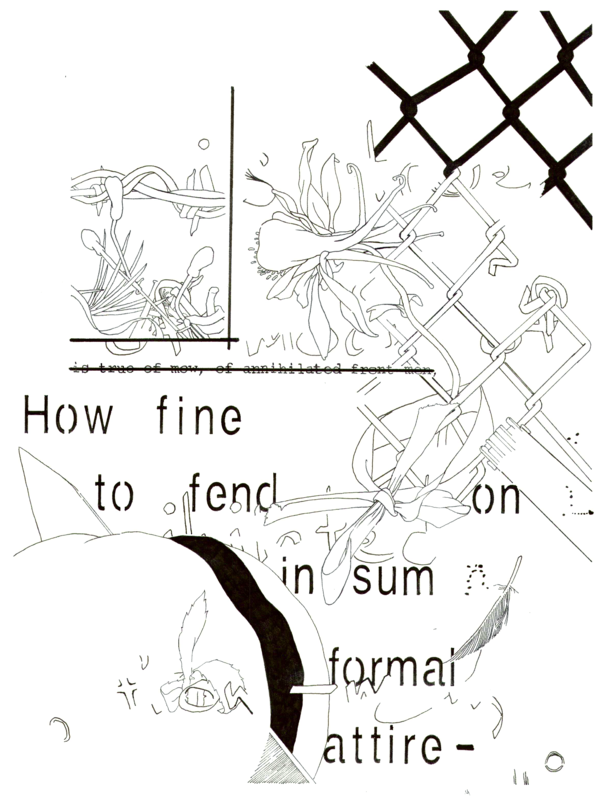 My visual poems take the constrained and the recombinant as form and figure. Recurring imagery and a black-and-white palette speak to and of the anagrammed words obscured and revealed in each piece. 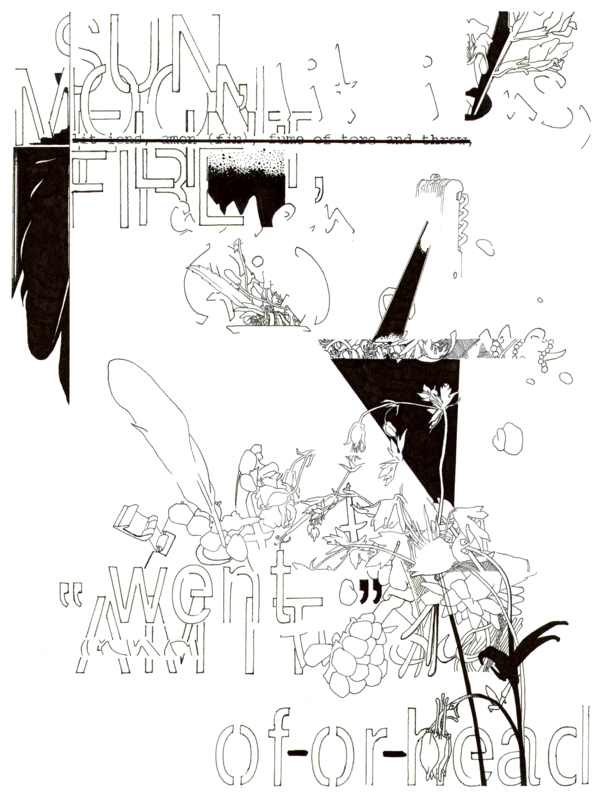 The anagrams simultaneously dismantle and bind, echoing the obsessive visual repetitions and re-formations. The methods, concerns, and materials of this visual project are in conversation with my third collection of poetry, Stet, forthcoming from Princeton University Press in 2018. 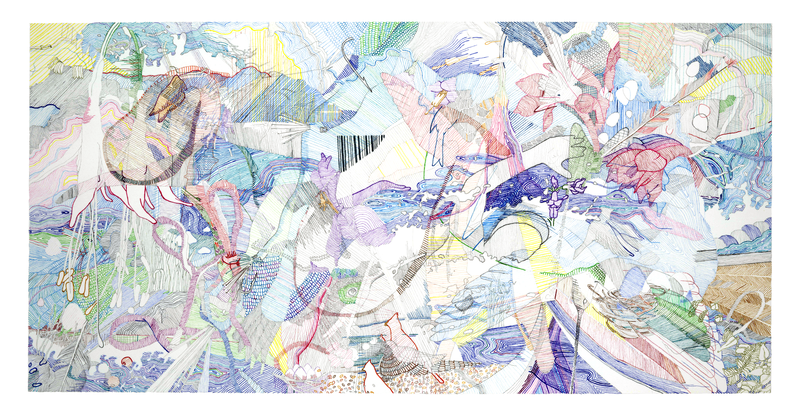 Some of these visual poems are forthcoming in Poetry. My other visual pieces here are also in conversation with my poetry. While these pieces don't integrate text like my "visual poems" do, some share titles with poems and incorporate thematic and emotional elements that reverberate off of texts while also functioning independently, while others accompany poems as letterpress broadsides. 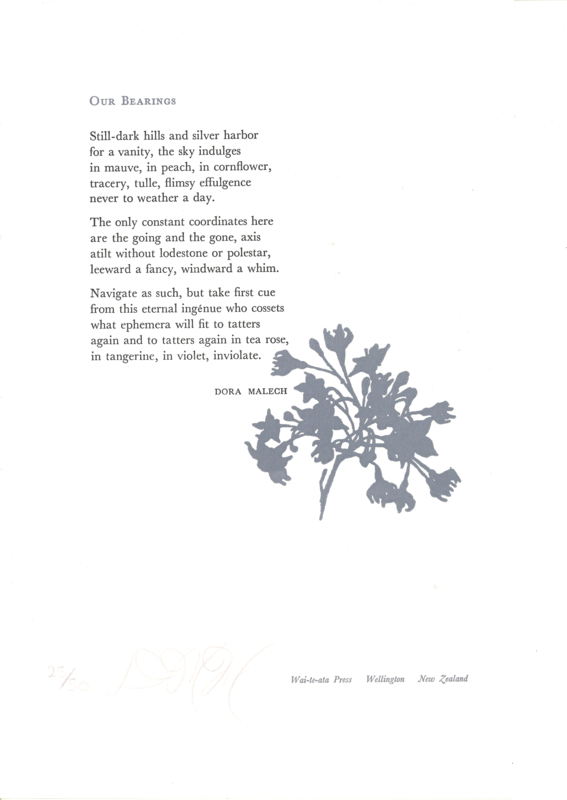 This limited-edition letterpress broadside was printed by Sara Sauers at Catstep Press in Iowa City, Iowa in 2011 in celebration of my reading at the Mission Creek Festival. 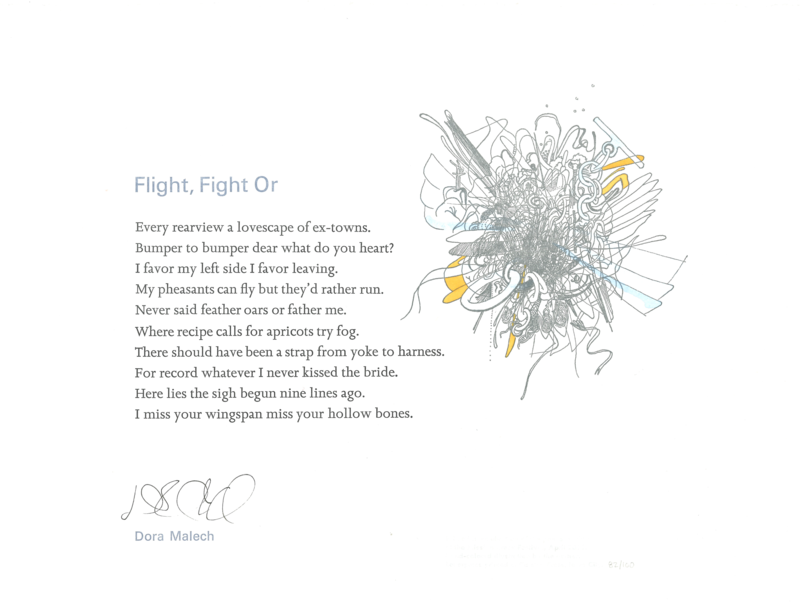 It is one of 100 printed, each featuring my poem “Flight, Fight Or” from Say So (Cleveland State University Poetry Center, 2011) alongside a hand-colored illustration of mine. I designed and printed this limited-edition letterpress broadside at Wai-te-ata Press in Wellington, New Zealand while I was a visiting professor in the MA Programme in Creative Writing at Victoria University's International Institute of Modern Letters. The broadside is part of a print run of 50, each featuring my poem "Our Bearings" from Shore Ordered Ocean (The Waywiser Press, 2009) accompanied by my artwork. 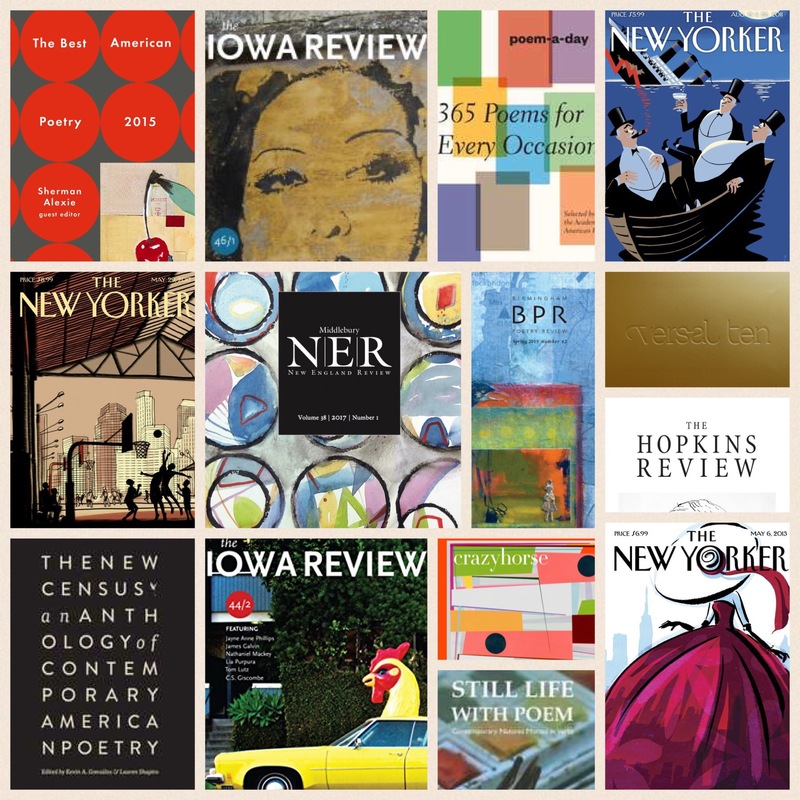 Blogging for The Kenyon Review since 2015 has enabled me to reflect on poetry, poetics, and creative pedagogy in an ongoing way. I have connected the work of poets past and present to the conversations of contemporary writers and readers, including interviews with poets, activists, and editors engaged in literary efforts on and off the page. My recurring concerns include: curriculum diversity in the literary arts and inclusive teaching methods, traditional and experimental forms, and connections between the artistic and the political. 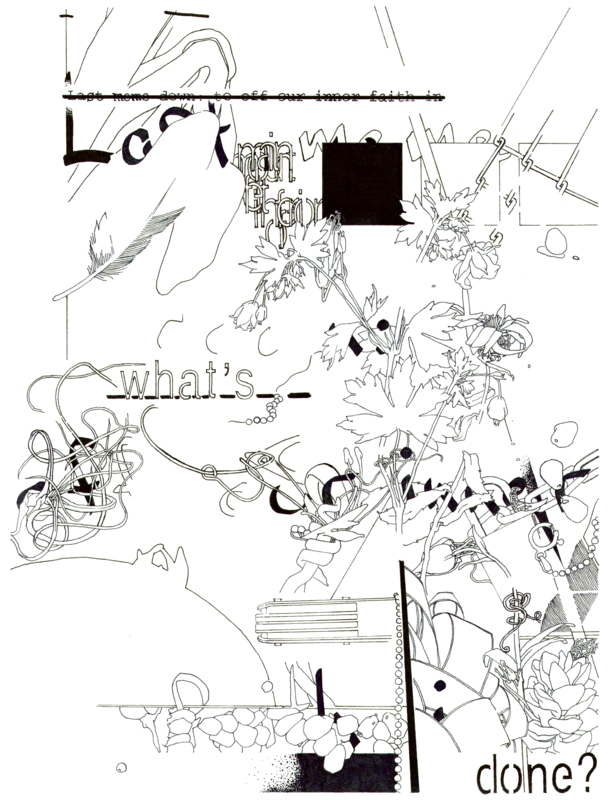 December 19, 2016: In this piece, I connect the anagrammatic poetry of Surrealist writer and visual artist Unica Zürn with my own experiences working with experimental constraint-based form (see my project Stet above). The organic progression between this post and the subsequent posts featured here is representative of my writing for The Kenyon Review blog, in which a personal interest or experience often becomes a catalyst for a broader investigation of contemporary poetry and literary history. December 21, 2016: A mention of the Oulipo writers in my previous post on Unica Zürn and the anagram leads to this piece on the formally innovative work of Harryette Mullen in relation to the Oulipo writers, exploring questions of influence, conversation, poetic "ancestry," and inclusion. December 22, 2016: This piece considers poetic innovator Terrance Hayes, focusing on his Golden Shovel form and his work with the anagram, and circling back to the relationship between the work of Hayes and that of Harryette Mullen, the subject of my previous piece. January 6, 2017: Here, my thoughts on formal innovation in the previous pieces begin to cohere into a more intentional exploration of the connections between some contemporary poets working with form in exciting ways. January 14, 2017: I continue my exploration of innovation in conversation by asking questions about poetic lineage while focusing on anagram rhyme in poems by Randall Mann and Richie Hofmann. February 1 2017: This piece reflects on contemporary formal innovation in the broader context of ancient traditions of echo verse, acrostic poetry, and elegaic couplets. February 6, 2017: This is a close reading of A. Poulin Jr. Poetry Prize winner Chen Chen's poem "Chen [No Middle Name] Chen," focusing on experimental poetic form as exploration and enactment of identity. February 27, 2017: An interview with four formally innovative contemporary poets concludes this chronological selection and investigation, though the topics addressed here are representative of ongoing concerns and passions I continue to explore through my writing for The Kenyon Review's online presence. An historic partnership between the International Writing Program and the Moscow Art Theatre, Book Wings was a bilingual performance that brought together the worlds of literature, theatrical performance, and new media. Book Wings united two stages and theatre companies to produce (in real time, across ten time zones) a collaborative performance of new poems commissioned for the project. A three-year initiative, 2012 marked the first annual Book Wings performance and featured American and Russian poets addressing the theme of contact. My contributions to the project are a piece titled "Travelogue" and several translations of the Russian poet Inga Kuznetsova in collaboration with Mayhill Fowler. Here is the program for Book Wings as performed in both the United States and Russia on March 9, 2012. My translations appear on pages 12 - 16, and my commissioned work, "Travelogue," appears on pages 23 - 28. "Travelogue" was published in Lana Turner, and these selections were later published by 91st Meridian Books in the collection Book Wings: A Virtual Drama, edited by Christopher Merrill and Ashley Davidson. As I edit Stet and Flourish for publication in 2018 and 2020, I am in the very early stages of work on a new, as-yet-untitled manuscript that explores how we "locate" ourselves through our senses of home, identity, allegiance, and truth – our moral and geographical compasses. Poems from this manuscript have appeared or are forthcoming in publications that include Poetry International, Modern Language Studies, Memorious, Lana Turner, and The Hopkins Review (featured in its recent portfolio of poetry inspired by the Baltimore Museum of Art). Five poems from my manuscript-in-progress were published in the Summer 2017 issue of Modern Language Studies. First published in the Summer 2017 issue of Modern Language Studies, the Academy of American Poets features my poem "Aletheia" on its site. Perfect for those corrections in a hurry!